Get PO Box 2381 Jobs 2019 Matric Pass Eligibility Criteria Latest from this page of our site. For all the Govt job seekers here job is there from Public Sector Organization which is looking to appoint the energetic, caliber and well-disciplined applicants are required to apply for the following positions given below. 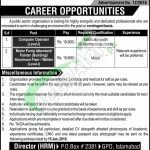 Jobs in PO Box 2381 Islamabad to apply are named as (Computer Operator and Motor Pump Attendant / Painter (Building) / Aluminum Fixer / Welder) are the posts which need to be filled by the applicants on a contingent basis and the overall qualification of Matric with relevant experience is required to apply. Age limit should be 18-35 years and relaxation will be paid on the basis of experience. Attractive salary package will be paid to the applicants with fringe benefits as Service Allowance, Gratuity, Housing/Hiring and Medical facilities will be paid to the applicants. Now, I will let you know about its further details below. Applications accompanied with CV and all copies of educational and experience certificates, CNIC and one recent passport size photograph should reach at the said address. The last date for applying is January 15, 2019. Govt and Semi Govt employees should apply through proper channel by producing the NOC from the parent department. Last Date To Apply: January 15, 2019. Address: Director HRM, PO Box No, 2381, GPO, Islamabad.